Do you know who you are, what you want, and express it unapologetically? 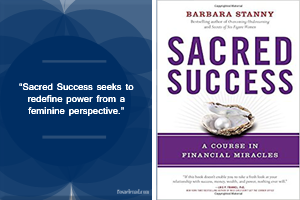 SACRED SUCCESS is Barbara Stanny contribution to embrace the power for women in a society where powerful women could be called bossy, among other things, as a way to diminish their presence in the world. This female power is necessary to balance the feminine and masculine presence while taking important decisions that affect humanity and the planet without bashing men. In this book, Barbara Huson opens up about her story, how she went from feeling powerless to achieve her financial success and the importance of spirituality on healing her relationship with money through a course in miracles. She quotes the course here and there when it is pertinent so you don’t need to have previous knowledge about it. The book intercalates her story with her knowledge focused on three aspects: the problem, the process and the power. Her experience with entrepreneurs in the retreat called SACRED SUCCESS supports with examples how this knowledge affects women in business and how it is not about the money more often than not. Concepts as power, surrender, affluence and greatness, among others, would be explained in a down-to-earth way. Furthermore, an important part is committed to teach “using money to make money” called “Wealth Building 101.” Each chapter can have exercises, homework or meditation to help integrate all the ideas and a questionnaire to know where you are with your finances before reading the book.